Hello everyone! Sorry for disappearing this entire week! I ended up getting pretty sick (remember when I said my lungs felt like they were exploding out of my chest) and kind of bummed for a few reasons. I can’t run Silver Strand next Sunday anymore and I also had three midterms this week! But, these are snapshots of the best parts of each day I disappeared for! Trying to brave the sickness on Tuesday with some easy lifting and cardio at the gym. Thanks JFK. This quote was the perfect way to start the morning. Weights, I have missed you. So maybe elliptical-ling with a bad cough wasn’t the best idea… only lasted 25 minutes. Fine, I’ll go to Student Health to see what’s wrong with me. Turns out a bronchial infection and restricted airways. This inhaler they gave me has been saving my life. That and the embarrassing mask they made we wear in the waiting room. Anthony and I went to Fat Sal’s for dinner one of the nights too! They have really crazy sandwiches with mozzarella sticks, cheeseburgers, and fries in all one sandwich. Everything on the menu seemed like a heart attack waiting to happen so I settled with a veggie wrap with french fries in them. Whoever thought of adding french fries to these wraps was a GENIUS. Anthony got the Fat Pilgrim, which is basically Thanksgiving happiness squished between a huge sandwich roll: stuffing, cranberry sauce, turkey, and french fries. I definitely stole a few bites of that. He’s having a moment. So many cups of tea to try to beat this sickness! And trips to the bathroom. 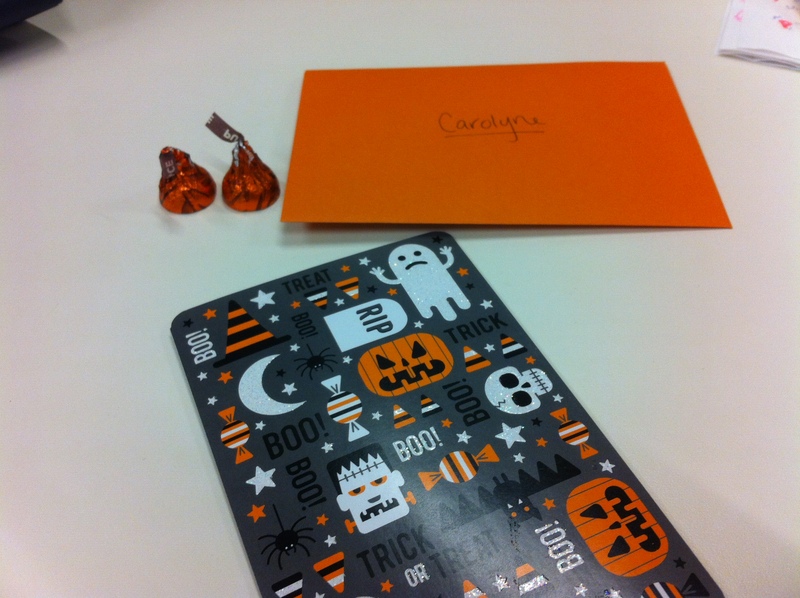 A cute Halloween card from my co-worker at CAF! Before Jason sent me home early from all the coughing. I am pretty bummed I won’t be running Silver Strand but I have another post coming up in terms of how to deal with race disappointment (or not racing disappointment). I think this was the sign from my body it’s time to take a break after a pretty tough race season this past year. How has your week been?! Tell me everything!